Please note that the content of this book primarily consists of articles available from Wikipedia or other free sources online. 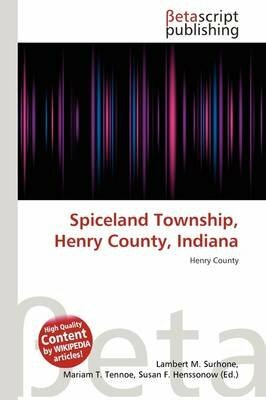 Spiceland Township is one of thirteen townships in Henry County, Indiana, USA. As of the 2000 census, its population was 2,200. Spiceland Township covers an area of 22.36 square miles (57.9 km2); of this, 0.05 square miles (0.13 km2) or 0.22 percent is water. Henry County is a county located in the U.S. state of Indiana. As of 2010, the population was 49,462. The county seat is New Castle. Henry County is regarded as the main inspiration for the setting of the novel Raintree County by Ross Lockridge, Jr..